University Town hasn’t ever been on the fast lane when it comes to pace of development work but much of everything else about the project seems great. And that’s especially true for those looking to gain more over time, and are investing small today. Perhaps affordable rates is also the reason why property transaction volume here didn’t really drop and has lately gone up. Here is the latest update on University Town. A surge in demand was noticed soon after the election dust settled, which came as a sigh of relief for those operating in University Town. That’s primarily because the agents operating here had to deal with a dry investment period during Ramazan and right after Eid-ul-Fitr. 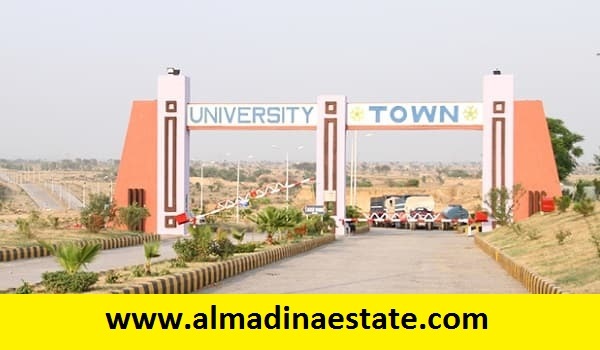 The fact remains that the society mostly interests investors having medium to long-term plans, as well as the end users looking to avail the currently low rates of residential plots in University Town. some end users are also hunting for options available at cheaper than market rates and they are often left disappointed because owners here don’t bend on rates. 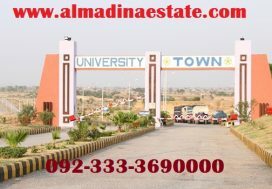 The confidence comes from the society’s great location on Kashmir Highway and Islamabad-Lahore Motorway M-2, in close proximity with Eighteen Islamabad, Islamabad International Airport, Faisal Town and also many prime areas of both Rawalpindi and Islamabad. The society has been around for a while where its last booking for plots in Block F was closed in 2013. But so far, the developer has been able to complete development work by 100% only in Block D. Some lanes and parts of Block A and B are yet to be finished, but the good part is that property possession has been handed over in the developed parts. This block is currently in the preliminary stage of development. So far, work has been carried out on carving the road network on 50% of the area, while land is being leveled in the remaining. For the road network, carpeting stage is next for which work is expected to begin soon. Block C has seen addition of more land in its Extension parts, making it the biggest block of University Town. It is also one of the few blocks where development work is underway. Development work here has been completed by 100% with possession available throughout the block. So far, four houses has been constructed, but none of them are occupied. Block D is one of the most expensive blocks in University Town. It will also be the block via which the society’s access road from Kashmir Highway will be located, but for that, development of Eighteen is needed, which doesn’t appear to be happening in the short term. Development work in this block is also done by half. The road network has reached the stage where it is up next for carpeting, while laying of sewerage lines has also been completed. Up next is erecting poles for electricity, and laying lines for gas, water and electricity supply. In terms of ongoing development work, this block is the most active one.